Everybody likes to hate an expert, especially a planning expert. We here at JHJ actually believe in expertise, but we are beginning to suspect that at least when it comes to Helsinki’s transport planning, f*** idiots are solidly in charge. Why? Because of the cars. The weird situation in Jätkäsaari that I mentioned a couple of weeks ago isn’t an isolated case. It’s official, Helsinki MUST HAVE MORE CARS! And so it’s been wonderful to see some critiques. Even The Usual is reporting that one parking space costs 40K euro and asking who should pay (10.9.2011 if you have a subscription). Now Hesari readers at least realize that those of us who prefer life without a car are subsidizing the very thing we most hate and suffer from: other people’s excess metal cows and the s**t that’s farted out through their quaintly named “exhausts”. 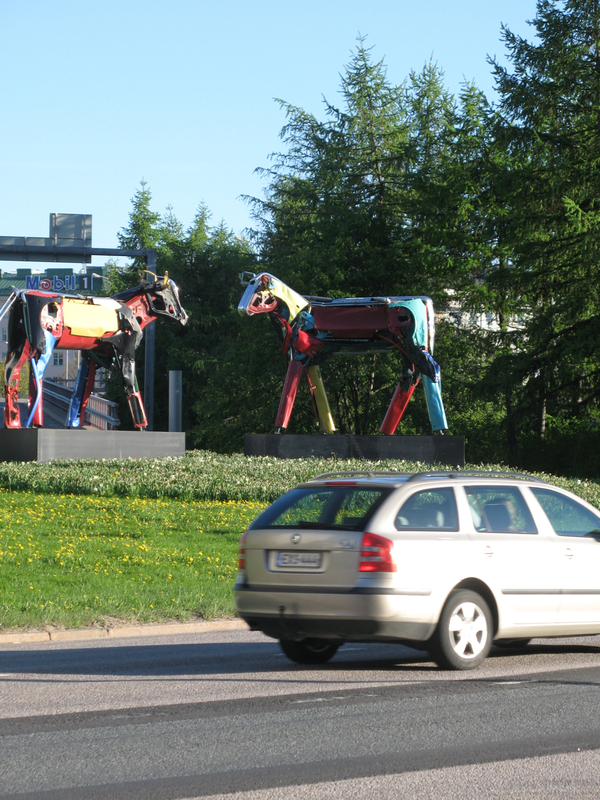 (On the left, metal cows parodied by Miina Äkkijyrkkä – more about her and her “sacred” cows on Hellosinki). So, on 10.09.2011 Hesari got a lefty Green and a Conservative (Kokoomus) chap to explain why a driver should pay his own way and why society should subsidize a driver, respectively. A week later the paper reported on another aspect of Helsinki’s love-affair with cars: this business about blasting into the granite on which our fair city is mostly built, in order to stuff cars into them and off the streets. (Will a similar solution be suggested for anti-social behaviour soon?) Unlike our lefty Green friend, JHJ does not endorse this practice. As you may know, JHJ’s editorial offices have from time to time been affected by the scary and perverse sounds of underground dynamiting too. Now as OP Pohjola expands its premises, Hesari reports that the old wooden buildings of Vallila are to be put at risk to make room for the growing backsides metal cows of workers at Pohjola. According to the interviewed rep from Pohjola, employees are simply not always able to use public transport. Might these be the same people who were clogging up Tuusulantie (in both directions) the other day when we were on the bus going to the airport?